I think it might be time I ditched the Flat Earth hashtag. Things are getting a little shaded. I think it's time to go somewhere beyond. So this'll probably be my last post with "Flat Earth" in the title. In conclusion I've seen enough to make me deeply sceptical that mainstream science has all the answers it says it has, but at the same time I've seen enough to know that there's a lot of disinformation in the Flat Earth movement. Half the major YouTube channels dedicated to the topic seem backed and pushed - if not by "the government", then by other interest groups. There's something to all this, but exactly what I just don't know. I'm left with a few obvious anomalies to guide me. Anomaly One: NASA & Co can't do what they claim they can do in "space". Anomaly Two: The politics and science surrounding the Antarctic continent is very odd, and doesn't make too much sense in light of the traditional narrative we have. After that I don't really know what to believe ..but I'm very, very curious and will keeping investigating. Going back to the topic at hand I thought I'd mention "the Collins Elite" in this post. The Collins Elite are supposedly a secret group within the U.S. government that believe that UFOs, far from being nuts n bolts spaceships from other planets, are actually demons - that's demons in the biblical sense. The group were brought to public light by Nick Redfern, in his book Final Events. It's a good read and I highly recommend it to anyone interested in the UFO topic. Anyway, when I first read the book a few years back I found it fascinating, as it made sense of a few things that previously had seemed quite odd. Now personally I don't believe that UFOs are demons, in fact I'm quite agnostic about the whole UFO issue in general, however I do believe that some people believe they are demons - if that makes sense. And it maybe explains some of the more bizarre aspects of American foreign policy that we've seen over the last few decades. For example, take the story that George Bush referenced "Gog and Magog" when trying to persuade French President Jacques Chirac to support the war in Iraq. According to French sources Bush saw "Gog and Magog at work" in the Middle East and believed that biblical prophecies were unfolding there. When this story first appeared it seemed simply bizarre that a world leader would be speaking in such terms. Just as it seemed equally bizarre to us here in the UK when it was suggested that George Bush and Tony Blair "prayed together" in the run up to the war. In fact, Tony Blair even converted to Catholicism straight after stepping down as Prime Minster. Are these guys really that religious? At the time I thought they were maybe just putting on a false front of piety, but maybe they really are believers. Maybe they have their reasons. Anyway, the subtext of all this is that 9/11 was faked as an excuse to trample into the Middle East, in a bid to fulfil end-times prophecy - by people high-up in the American government that literally believed that UFOs were biblical demons and signs of the end times. 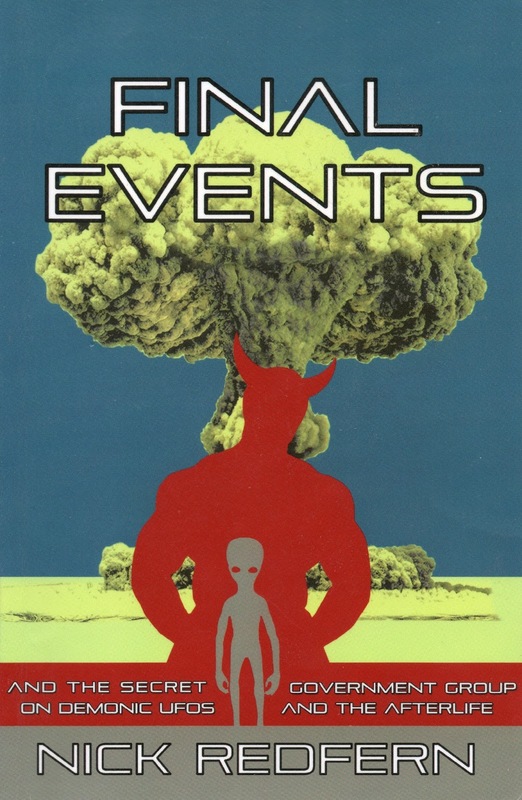 The book Final Events even contains testimony from one Collins Elite whistle-blower that elements within the government wanted to detonate a dirty bomb in an American city to pave the way for totalitarian lock down in the U.S. - in order to turn the U.S. into a true "Christian" state. I remember warnings about a "dirty bomb" attack being reeled out on TV at the time. All of this is quite far fetched of course, but again, it does kind of explain the "Gog and Magog" madness. And now with "Flat Earth" blowing up all of a sudden, it may even make a little more sense. If there is some sort of kink in the scientific chain when it comes to the state of our earthly realm, it may give people of a Christian mindset a little more reason to believe they have it right. Just as we're seeing on YouTube at the moment. Maybe the higher-ups have had a head start on this debate we've been having.